Simple but decent sound manager for Unity3D, with pitch and volume modulation, AudioSource pooling, positioned sound support, and playback completion callback. My take on a light-weight sound manager for Unity3D. Admittedly I haven’t looked into any implementations on the Asset Store, etc., because I didn’t want to spoil the fun of writing mine from scratch. So this is just a small, relatively simple component with solid core features that should perform reliably and efficiently. I’ve been using it in my project for quite some time, and I’m a satisfied customer, so to speak, so I decided to share it. Note that the comments in the code are a bit excessive if you’re an experienced developer. I just tried to help others too to understand it better. Update1: I added the capability of Transform tracking playback in the form of two new public methods. This means that the SoundManager can now be used for moving objects too. For this addition I refactored the class internally. Short testing shows this new feature to be working well, but please inform me of any bugs. Update2: I encapsulated all debug log messages into a separate class, and added a logging setting to the Inspector. So you can turn off logging for deployed builds in a way that completely avoids string operations and allocations (since all debug messages are constructed inside this helper class). Available logging settings: None, LogOnlyInEditor and LogAlways. Update3: I swear I’ll stop adding these update sections here. 😃 Anyhow, I refactored the SoundManager class again. Plus I changed the public method signatures. The most visible change is that the methods now return the sound type in the callback, so you can route multiple playback finished notifications into a single method, and check there which one was finished. In terms of refactoring, internally the class changed a lot; basically I encapsulated all AudioSource handling responsibilities into a separate nested class, and cut out all code duplication in the method overloads. If you have an AudioSource on a GameObject, and you destroy it (or ideally, disable for releasing into the pool), you can’t play any sounds on it, since sound playback stops instantly. Sounds sound the best if you slightly modulate the pitch and volume each time you play them, to make them feel natural. It’s messy to do this individually everywhere. You can set up the range of random pitch and volume for each audioclip at a centralized location. Then you just simply play the sound by invoking PlaySound(), and the pitch and volume will be automatically modulated each time. One given sound type can have multiple entries and AudioClips associated to it in the list. The SoundManager automatically creates a list internally from all ‘sound variations’ of a given sound type, and when you invoke PlaySound(), it selects one randomly. This is also a rather important part of providing rich and diverse audio experiences. You can define how many simultaneous sounds you want to support at startup. When you invoke PlaySound(), the SoundManager automatically reserves an AudioSource from the pool to play the requested sound, waits for the playback to finish, and puts the AudioSource back to the pool. No polling involved whatsoever. Coroutine-based operation. No wasteful use of collections; it uses a simple Stack the way it’s supposed to be used. If it runs out of available AudioSources, it can grow the pool on-demand (if you enable this feature). When the playback is complete, the AudioSource will be instantly put back to its original position. 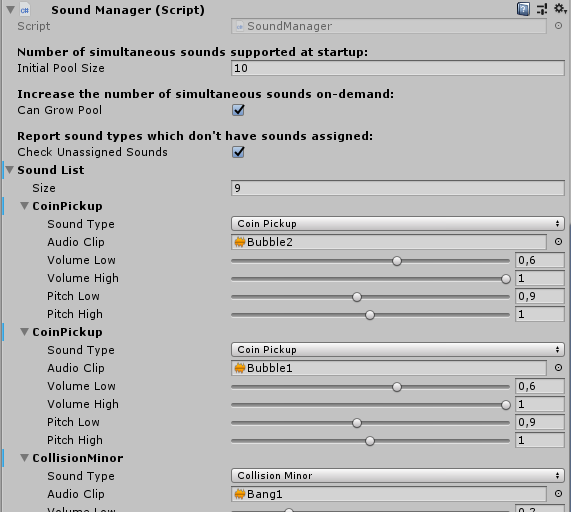 There is no expensive reparenting involved; the SoundManager simply creates a GameObject for each AudioSource in the pool at startup, so it can later position them anywhere. There is an overload of the PlaySound() and PlaySoundPositioned() methods that accept two floats which serve as multipliers to pitch and volume. So if you find yourself wanting to play a faster/slower or louder/quieter sound than normal, or play it reverse by using a negative pitch, you can. These multipliers are applied on top of the already randomized pitch and volume, so the sound variation is kept intact. All versions of the PlaySound() and PlaySoundPositioned() methods accept an optional callback parameter, in case you want to be notified when the playback finishes. If the playback fails for whatever reason, the return value is null, so you can actually check if playback was successful. I added standard XML documentation tags to all public methods, so Visual Studio’s IntelliSense can help you understand what do the methods and parameters do. Also, the code contains lots of comments, including on all private methods and everywhere where something might not be obvious. I think I went a bit overboard, because I know that many Unity3D users are not that well-versed in programming. There are a lot of checks internally for various error cases, and they log intelligible warning messages to the console. Of course you might want to strip out this debug logging, integrate some switchable or injected logging system, or whatever. I tried to avoid allocations and losing performance for no good reason. The code properly uses a Dictionary for lookups and Lists for indexed access, basically doesn’t new up and throw away anything, etc. One thing you might want to look into is the infamous allocation when you use enum as Dictionary keys. I have no idea if this still happens these days; if so, you can supposedly avoid it by providing a custom comparer for the enum. Just for illustrative purposes, because it’s really obvious and straightforward to use. Specify your sound types by editing the GameSound enum. This means that all the sounds you want to be able to play need to be named in this enum. This obviously has some drawbacks, for example you can’t just nilly-willy delete values from the enum and shift the rest of the values, because Unity actually saves the enum values as an integer. But using the enums is very comfortable, so I personally like this approach. If you want, you can look into associating explicit integer values to your enum values, and then it’s safer to modify it. Add the SoundManager script as a component to a GameObject. This hardly needs an explanation, if you have ever seen a computer before. Add entries to the SoundManager component’s Sound List array in Inspector. Change the ‘None’ sound type to an actual sound type, select your AudioClip, and set your pitch and volume ranges. Note that - obviously - Unity stores everything you add here with the given instance of the component, so you’d probably want to make a prefab from it, and use that in your scenes, or set it not to destroy on load. You’re ready to call SoundManager's PlaySound() and PlaySoundPositioned() methods. There is no Editor customization provided. The display of arrays in the Unity Inspector is hideous, so I did include some trickery (with platform-specific compile directives, restricting it to the Unity Editor) to at least replace the default 'Element'names with the value of the enums. But if you use some generic/universal Editor script package to prettify arrays, possibly even this is superfluous. One functionality that would be nice to have is a ‘Play’ button right besides the sound settings, so you could listen to how does the AudioClip sound with the given ranges. Maybe I’ll look into implementing this. Let me know if you happen to find any bugs, or spot any sort of weirdness with the code. I’m coming from normal .Net development, so I can’t rule out the possibility that I’m unaware of some weirdness in how Unity handles lifecycle of objects, coroutines, or who knows what. Only mentioning this because someone asked me about it. You can use this code for whatever or however you want. It’s not exactly a huge feat of software engineering. Perhaps just try not to sell it wholesale on the Asset Store as your own work. 😃 But if you make something significantly more complex out of it, feel free to call it your own and sell it if you want. Though, credit is always welcomed of course.